The Deep Andaman Queen liveaboard is a 30m beauty providing a comfortable and relaxing dive vacation. 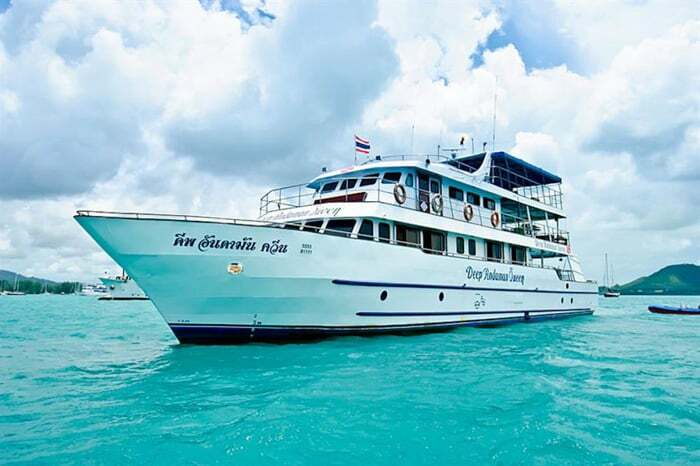 The Deep Andaman Queen offers four to seven days liveaboard safaris traveling the Similan Islands, Surin Islands, Richelieu Rock, and Burma Banks. She was custom designed for diving and even offers separate entry and exit platforms. The avarage price for diving with this liveaboard is 188$ per day. We have done the research for you and found everything you need to know about Deep Andaman Queen - we found the best prices and we've collected reviews from other divers. – American, Western and local cuisine. Friday night cocktail party. M/V Deep Andaman Queen is formerly known as “Queen of Scuba,” and specially designed to give divers an adventurous journey. It is 30m long and 7m wide, a strong steel liveaboard with a max speed of 12 knots. The English and Thai speaking crew will make sure our guests will enjoy their journey. This cruise ship has nine comfortable and spacious cabins to choose from and can accommodate 21 guests. The Master Cabin is the largest and most extravagant cabin with panoramic ocean view windows. There are Double Deluxe cabins with queen-sized beds and Standard cabins with up to four beds. All cabins have private bathrooms, air-conditioning, hot water, and life jackets. These cabins are designed for comfort and relaxation. Guests can relax between and after dives at the fully air-conditioned saloon and outdoor saloon that has comfortable couches. They can also pass the time on the boats’ sun deck with a shaded area and sun loungers to enjoy sun baths. For entertainment, they can enjoy watching the latest movies or reading marine life books and magazines at the small library. The chef on board will delight guests with a variety of American dishes, Western food, local Thai specialties, and barbeque. There will be fresh fruits, hot entrees, cereals and juices for breakfast. Breakfast and lunch are buffet style while dinner tends to have table service. They serve a variety of complimentary drinks such as soft drinks, iced tea, beer, and wine. It will surely keep the passengers’ appetite satisfied during the expedition. Vegetarian options are available, and for specific dietary requirements, guests can add this on their special requests on the booking form. Deep Andaman Queen has a two level dive deck spacious enough with room for all the divers. It’s located at the back of the main deck and is equipped with personal storage boxes, a camera table, wetsuit hanging area, fin storage, and a separate tank with fresh water for maintaining dive gears after dive. Nitrox and gear rentals are available. Guests have to provide their rental needs on the booking form. Safety boat navigation has a complete and up to the standard equipment. The attentive and professionally trained crew will ensure to provide guests the best service the MV Deep Andaman Queen can give. The Andaman Sea gives an ultimate diving experience that every diver desires. Visit and admire fringing reefs, deep drop-offs, wrecks, walls, caverns, pinnacles or open ocean seamounts and tunnels. Visit the small collections of islands at the remote area of the Similan Islands. Famous dives site areas such as Elephant Head Rock and West of Six, which are among the best in the country and can’t be found anywhere else. One of the premier dive sites of Thailand is Richelieu Rock that attracts scuba divers from around the world. Divers are drawn by the unique marine life Thailand beholds. Book now and experience an unforgettable safari.